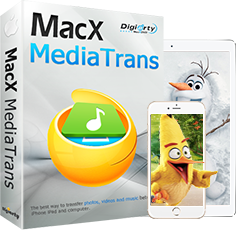 MacX MediaTrans MacX MediaTrans is an ultimate iPhone iPad manager. Take the opportunity to save big. The pricings are valid through April 30, 2019. Lifetime / 2 Macs Purchase license for one-time fee and free lifetime update. Lifetime / 2 PCs Purchase license for one-time fee and free lifetime update. For pricing and purchase related questions, please contact sales@macxdvd.com. Our sales support team will reply your message within 24 hours. Once you complete the online order, you will receive your order information and license code via email immediately. All-purpose Media Conversion and Transfer Pack - 65% OFFGet the best valued software suite with huge discount. Plus, get a popular audio video player 5KPlayer as free gift. Rip protected DVD to MP4, MOV, AVI, MPEG etc for iPad, iPhone, Android devices. 1:1 copy DVD to ISO file. All-in-one video toolbox designed to convert, download, resize, record videos with hardware acceleration. Transfer photos, import and export songs & videos at fast speed. Manage playlist. Use iPhone iPad as USB.